Visiting Ireland for the first time we were presented with The Dubliners Guide to Dublin, a pocket reference on all things to see and do while visiting the Faire City. Famous Dubliner poet W.B. Yeats once said,” There are no strangers here, only friends you haven’t met yet” and with that inspiration and our handy guide in hand, we pleasantly discovered that this convivial city lends to lively discourse while on a sojourners’ course. 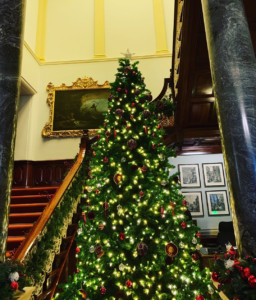 With a weeks’ worth of time on this December jaunt, we ate, shopped and museum-ed our way through Dublin and nearby surrounding areas with the help of the excellent Dublin public transport. The guide’s number one piece of advice, bring an umbrella. Noting Ireland’s changeable oceanic climate, we packed accordingly for our short winter stay donning lots of layers, and a good warm jacket. We happened a week before the Christmas Holiday, so downpours and cold winds are common, but we knew Dublin had plenty of brews, stews and wee bit of whiskey to dull the wind chill factor. Having the proper attire is a must as we readied ourselves for walking, reeling and two stepping through our tour of this great city. We were ready for a hot shower reprieve after a 10 hour flight from San Francisco. 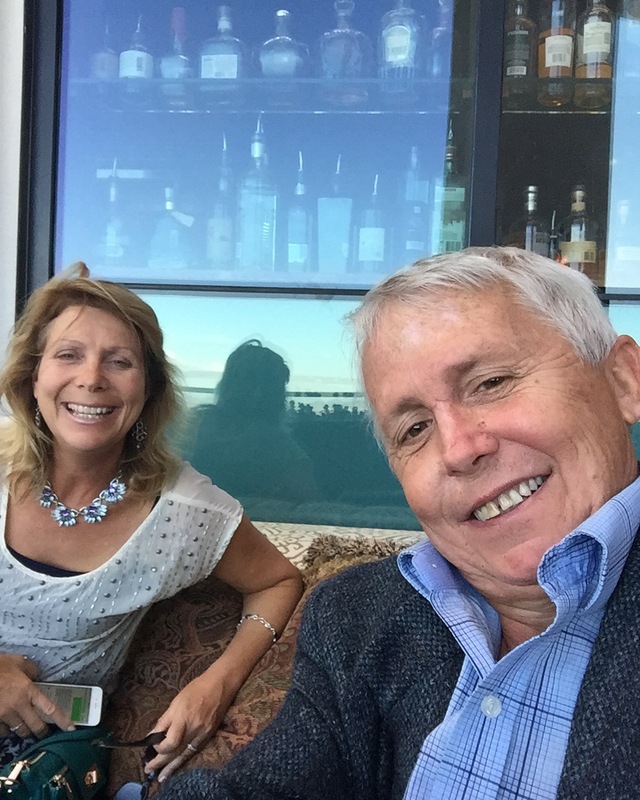 Once underway to the hotel, our garrulous Cabbie, a red-haired young lad with laughing green eyes whom upon telling him we were from Las Vegas went on to tell us that three of his siblings work in the US and his fiancee’s dream is to marry in Vegas. “We love America and our dream is to get married by an Elvis,” he exclaimed. We immediately felt welcomed by our new found friend. We finally made our way to the FitzWilliam Hotel, a centrally located 5 star accommodation. The FitzWilliam was bedazzled with holiday décor; life size faux polar bears lined the hallway leading to the festive front desk festooned with, silver, white and gold decorations. Aside from its premier location, the hotels 5 star rating in service and in amenities includes the Glovers Alley restaurant and the Inn on the Green where Dubliners and tourists alike can gather for a dram of whiskey, an excellent cocktail or a glass of wine. (Open 24 hours for hotel guests). 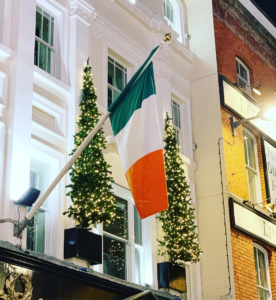 Conveniently located a block from the famed Grafton street, there is plenty of shopping, dining and drinking establishments within a 100 steps from the front door and our fair haired Cabbie advised that we must shop at locals favorite “ Penneys” for the best deals in Dublin. Train lines and trolleys are within a few paces for ease of transport around and about the city limits. 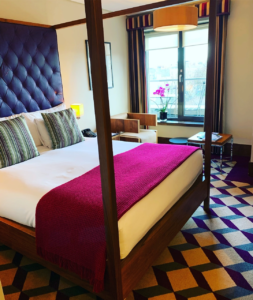 Directly across from the hotel is St. Stephen’s Green Park, a tranquil city oasis that boasts the prestigious Green Flag Award for the highest standards in parks and green spaces. 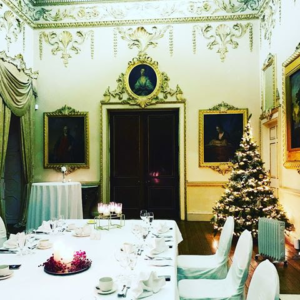 Upon settling into our well appointed room, we made haste to a scheduled holiday concert at the historic Farmleigh house, an estate of seventy-eight acres noted as an “art gallery, a working farm, and the official Irish State house” which Prince Harry and his new bride Meghan had recently spent a weekend on the premise. 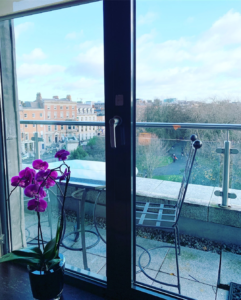 Located along the 22 acre public green belt of Dublin’s St. Stephens Green is a favorite community space for a host of recreational and community events. We marveled at the acres of lush lawns and the absence of trash along the route. 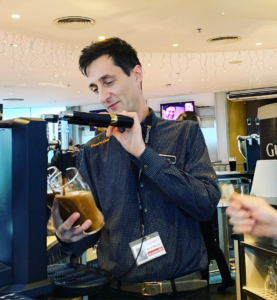 For those wanting to fast forward in learning more about the illustrious and industrious Guinness family and their economic, political and beer-making history, a tour of the Guinness Storehouse is well suited. Every city has their most sought after attraction and a trip to the Guinness Storehouse will cover 250 years of history with the best 360 views of Dublin while learning how to pour the perfect pint that changed drinking history. The flagship store is a popular gift buying venue with a large array of merchandise and don’t forget to look at their clearance section for the best deals in town. Invigorated by the lilting choral music and the festive atmosphere we were ready to experience our first dining venue. The principal shopping street, Grafton, glowed with glittering lights as caroling groups gave their best holiday renditions. We made our way to Fallon & Byrne. Better known for its Food Hall or “proper grocery” which is a popular local outlet to purchase and peruse the best in organic and artisanal foods. Boasting 3,000 bottles of natural delights, many locals love to stop and shop for organic food stuffs before or after a meal at the slow food restaurant. 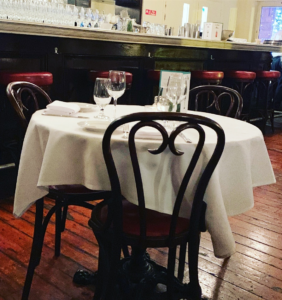 Tonight we were not here to shop, but to dine upstairs in this very European styled backdrop: white linen table cloths, hand polished wine glasses a top of café style tables. 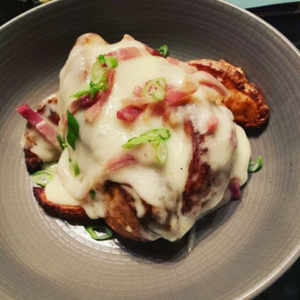 We were also intrigued with a claim that their dishes would be served by “cheerful sorts” and our likable server proved that moniker to be true with her attentive and gracious service. A large backlit oak bar adorned with stately antiques augmented the ambience. 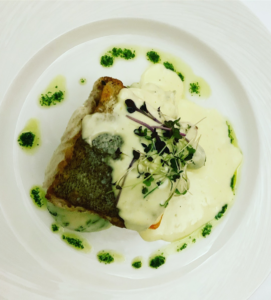 We were delighted as our dishes of local Hake (a firm white European fish) and aged Irish rib-eye steak with brandy peppercorn sauce arrived alongside a well paired earthy Bordeaux. Finishing with a true Irish coffee was a must before turning into our hotel. 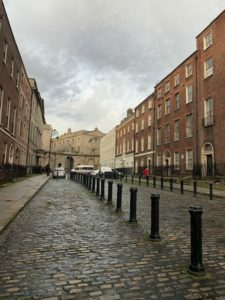 We awoke and readied for a day where the cold damp air and the antiquities of the city would lead us into the shadows of the past while chronicling Dublin’s rich heritage. On this mornings’ docket, an eager investigation into the monoliths of religion, rites and infrastructure that have dominated the political and economic structure of Ireland for centuries. 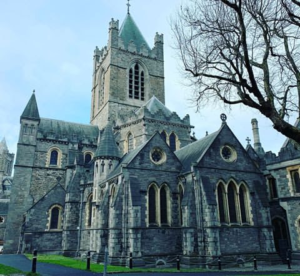 The impressive Christ Church Cathedral whose original structure dates back to 1030 was our first on the line up of old school religious institutions. Our guide Daire, a slight, balding middle age man with rosy cheeks maintained a very melodic almost hypnotic tone during his elaborate history discourse. 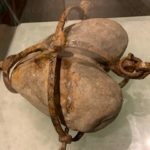 the 800 year old Patron Saint to Dublin, Laurence O’Toole’s heart coffin, the costumes from the cast of the Tudors mini- series located in the underground catacombs alongside millions of dollars of gold and artifacts and miniature fabric sheep placed around the pulpit. Upon inquiring, Daire told us that the sheep miniatures are a part of scavenger hunt for the local school children. 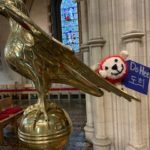 It was amusing to see a cuddly looking creature perched on a statue of St. Paul as others sat solemnly in the pews looking at the stain glass windows and flying buttresses. 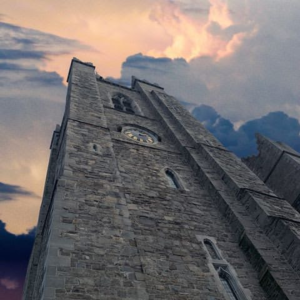 “Would you like to ring the bells in the tower?” inquired Daire. “This is where New Years Eve is traditionally rung in the city of Dublin.” After timidly ascending a precarious stone spiral staircase to the Bell Tower, we entered into the cold, cramped space of exposed brick walls and various many colored cords that hung in a circle from the ceiling. As we took a hold of the rope we were amazed at the amount of strength involved in bolstering the proper swing and ring. As we got into our swinging sway, we promptly added to the chiming of the grand dame of bells with our rendition of a 1970’s tune, “Ring My Bell”- Disco which never sounded so good. Spending a good majority of our day within the Cathedral, we were ready for cup of hot Irish tea and lunch. The Queen of Tarts, local bakery and casual restaurant is known for their tea service and baked goods and we were feeling frigid and famished for a warm bowl of local corn chowder, a freshly baked scone and piping hot cup of Irish tea. 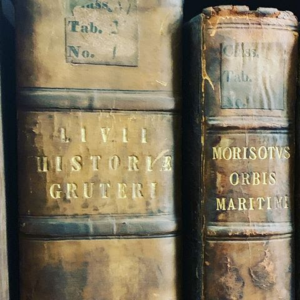 Revived by our mid day break, our walking tour concluded with many of the historical high-points along the way, including Marsh Library which holds 300 years of prized literary works. So sacred are these texts that one must enter a cage like structure where you are locked in to look through the ancient manuscripts. Upon our introspective jaunt around the cobbled courtyard of Trinity College of Dublin considered the most prestigious university in Ireland and home to the antiquated Book of Kells and the ubiquitous St. Patrick Cathedral we finally came to a newer addition in points of interest that of 14 Henrietta Street. A building located along the most viable collection of early to mid-18th century houses in Ireland and a sought after movie location. 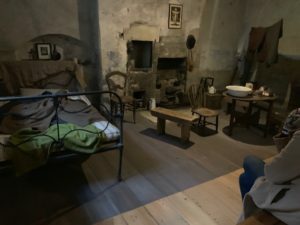 This new exhibit opened late 2018 chronicling the life of a building that reflected social change from a Georgian manse into to tenement dwelling in which families of 12 or more children would often reside in abject poverty. Henrietta Street has restored 300 years through architectural and sociality storytelling of those who dwelled within these nightmarishly tiny cramped spaces and dimly lit stairwells. 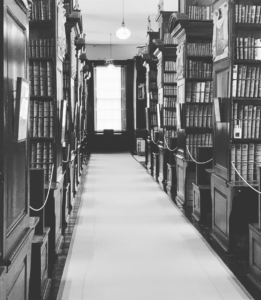 By procuring, educating and honoring Dublin’s tumultuous history, 14 Henrietta Street is a welcome addition to the historical narrative. 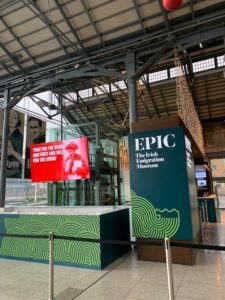 In concluding our short overview of Dublin, a mandatory walk through Epic- Irelands Immigration Museum and the world’s only fully digital museum founded by Former CEO of Coca-Cola, Neville Isdell was a must of the agenda. Upon acquiring the building built in 1817 as Stack A or the Tobacco Store and warehouse for coffee tea and spirits, the original exposed bricks and infrastructure have proved the ideal place for this unique look at Irelands Immigration. After listening and interacting with the many computer screens and digital documentation, our conclusion was that Ireland truly is the Mother Land on every platform. This is the small country where so many people come from and have created societal and political infrastructures that have shaped the world. Former Irish President Mary McAleese said, “The immigrant’s heart marches to the beat of two quite different drums, one from the old homeland and other new. The immigrant has to bridge these two worlds, living comfortable in the new and bringing the best of his or her ancient identity and heritage to bear on life in an adopted homeland.” This sentiment is noted as 22 of our American Presidents carry Irish genealogy, as well as the multitudes of famed singers, inventors, business people that have come from the flux and flow of Irish Immigration. Croque Monsieur with organic Burren pulled perk, ham, mustard, bechamel sauce, goats cheddar. Conveniently set next to the museum is Ely Bar and Grill. Owners Erik and Michelle Robson’s stellar 80 by the glass wine list and 500 by bottle offerings coupled with a menu that brims with local ingredients, makes Ely Bar and Grill the consummate place to reflect on the information that has shaped history. 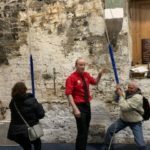 Early evening had come and our last jaunt of the day included look at history with an interactive dramatic theater called the Vaults Live. Only a few months opened to the public albeit the former school building build took 4 years to secure and transform into mini- theaters. As you enter into the various time period rooms each actor gives a live dramatic presentation from scripts written by award winning playwright Peter Sheridan. The lively presentations capture some of the sordid or dark moments of Irelands history: A humorous portrayal of Molly Malone, a rambunctious Viking’s account of his Invasion of Ireland, A Hench man’s recall of his dirty deeds along with Bram Stoker’s Dracula that may scare you into believing that vampires are real. The Vault is situated over 4 floors with six stories that will come to life in this newest addition of history meets adventure. We needed some down time after all the intellectual undertakings and we found the perfect reprieve at several pubs that dominate the social landscape. This time we met three entrepreneurial teachers known as the Irish Folk Experience who promise to help you sing, dance and play. Move over painting parties, this innovative and interactive music making event is indeed a lively and fun experience for the 21 and over crowd. These fine lads of The Irish Folk Experience have combined their mad music skills at Hely’s bar, a part of The Mercantile on Dame while instructing us on how to play the Bodhran an Irish frame drum that resembles a tambourine but without the cymbals. After learning the appropriate hand placements we eagerly struck the round top with a piece of wood known as a cipin filling the pub with the sounds of our fast paced beats. 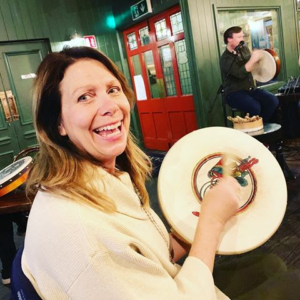 Now it’s the wrist action in wielding the cipin that is a bit tricky but after a few pints and several choruses of Molly Malone we mastered the beat of Bodhran just brilliantly. 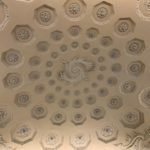 On our journey through the countryside we made our way to several manses beginning with the Russborough, a Palladian mansion with a prominent façade covering 700 feet across rolling green lawns and elaborate plaster ceilings created by Swiss ornamental plaster masters, the LaFranchini brothers. 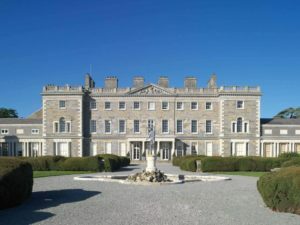 The German architect Richard Cassels designer of the original building in 1741 for Joseph Lesson, 1st Earl of Milltown but it was Sir Alfred and Lady Beit whose fortune (largely made in diamond mining) purchased Russborough in 1952. Together they acquired and displayed an unrivaled collection of Old master paintings including works by Gainsborough, Vermeer and Goya. With such rare and expensive art pieces in the collection, several notorious robberies have taken place over the years that have been the subject of TV movies and media coverage but surprisingly most of the paintings were recovered. In 1976 the Beits created a charitable trust for the advancement of the fine arts and then opened the house to the public in 1978 as a vehicle in exhibiting Irelands’ architectural heritage and their unparalleled art collection. An official Exhibition Center opened in 2014 chronicling the mansion’s rich history. With its elaborate and elegant art works surrounded by the festive ornamentation it was effortless to imagine being a Lord or Lady in this sublime setting. A quaint gift shop with reasonably priced trinkets alongside Kitchen Garden Cafe are also located on the grounds for the average 2,000 visitors per month that clamor for a glimpse of Ireland’s past grandeur. After exploring Russborough, it’s time to hit the road and head out into the “Garden of Ireland “and explore the foothills, hiking paths and small ancient villages that many have read about as small children. 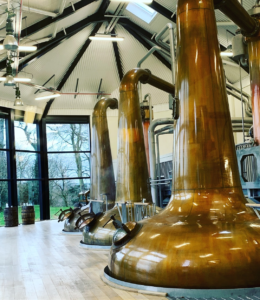 Along the countryside, there was a must stop to “wet our whistle”, a newly opened whiskey distillery, of course, and a great one at that. Following a walking path between emerald green pastures, we bonded with some new equine friends as we continued our journey up a small hill until we saw a very welcoming sign. 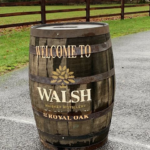 A whiskey barrel hand painted with WALSH Distillery with an arrow pointing us in the right direction. We had made it! Greeted immediately upon arrival by effervescent manager Woody Kane who kindly placed an Irish Manhattan into our eager hands at 1030 AM! What a brilliant way to start the day. He explained the Manhattan features their own Irishman Founders Reserve Irish Whiskey, sweet Vermouth, Angostura bitters and a plump Maraschino cherry for garnish. Finishing our cocktails, it was now time to get down to the business of whiskey making and tasting. Wondrous aromas of peat, grain and oak engulfed us as we made our way to the highly polished copper pots that were hard at work. 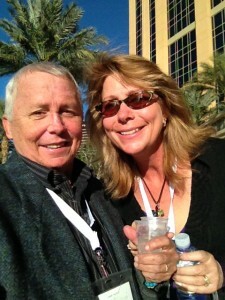 “Owners Bernard and Rosemary Walsh are passionate and pay attention to detail,” Woody said as we took our first sip. “We specialize in small batch hand-crafted high-quality whiskey using recipes that have been in the family since the 19th century,” he added. The Walsh Writers’ Tears Copper Pot is very special. It is unique blend of aged Single Pot Still and Single Malt whiskey distilled entirely from Pot Still and Malt, without Grain and triple distilled, then aged in American Oak bourbon casks. 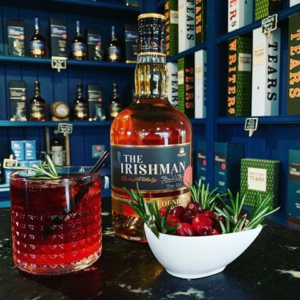 It recently won a gold medal in London and named one of the highest rated Irish Whiskeys in Jim Murray’s Iconic “Whiskey Bible”. Educated and thirst quenched for now, it was time to continue our journey through the glorious Irish countryside. 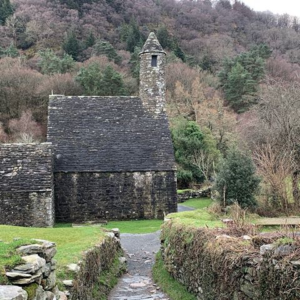 Traveling through foothills, damp from the slight sprinkle of rain and pausing occasionally for sheep crossing the road, we arrived in the ancient Monastic City Glendalough, one of the most important monastic sites in Ireland. The settlement was founded by St. Kevin dating back to the 6th century. One can spend hours wandering and reading the immortal tombstones, many adorned with the Celtic cross. You can almost feel the people of centuries past watching as you explore the ancient buildings that date from the 10th through 12th centuries. In the center of these hallowed grounds looms the massive Round Tower which stands 30m high from over a mile away. 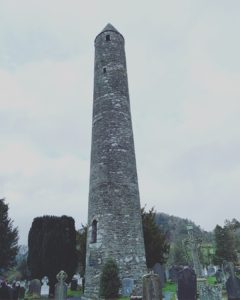 Despite attacks by Vikings over the years, Glendalough thrived as one of Ireland’s great ecclesiastical foundations and schools of learning until the Normans destroyed the monastery in 1214 A.D. and the dioceses of Glendalough and Dublin were united. This is on the list for a return visit. For now, we are on the road to the medieval city of Kilkenny. 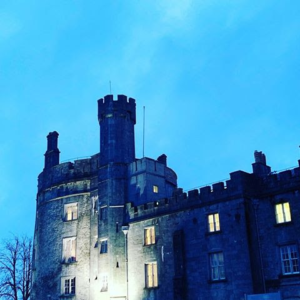 Arriving in the medieval city of Kilkenny is unforgettable. It takes you back in time- 1195 to be exact. Kilkenny Castle was built to control a fording-point of the River Nore and the junction of several route-ways. It was a symbol of Norman occupation and in its original thirteenth-century condition it would have formed an important element of the defenses of the town with four large circular corner towers and a massive ditch, part of which can still be seen today. 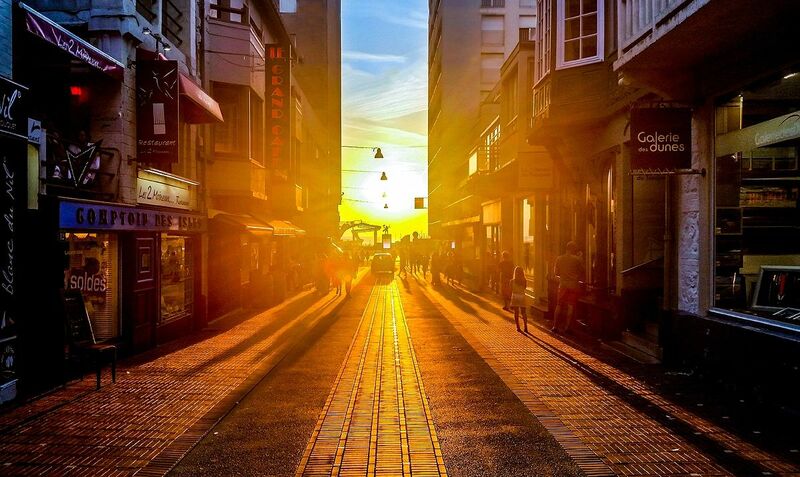 It’s a city like non-other we have visited in the past. Take a walk or “knockabout” and explore a network of maze-like alleyways and lanes, see St. Canice’s Cathedral, with its massive stained-glass window, and visit the restored 17th century Rothe House. In 2009 the City of Kilkenny celebrated its 400th year since the granting of city status in 1609. Today, it melds medieval history with cosmopolitan city life. It still buzzes with energy from its medieval mile with chic shops and restaurants to the walls of the ancient Marble city. Right it the middle of it all, Kilkenny city’s Norman Castle still stands tall. The Sun was setting low in the sky slowing fading into the boggy mist as we made our way to our accommodations for the evening. Macreddin Village is a multi-award-winning Village located in picturesque Wicklow Valley just 1 hour from South Dublin. 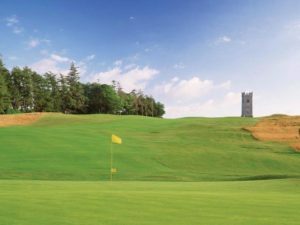 It is also home to Macreddin Golf Course, designed by European Ryder Cup Captain Paul McGinley, Actons Country Pub & Orchard Café, an Organic Bakery, and Macreddin Smokehouse. The Brook Lodge Hotel located in the heart of the Village opened in 1999 and would be our home for the evening. 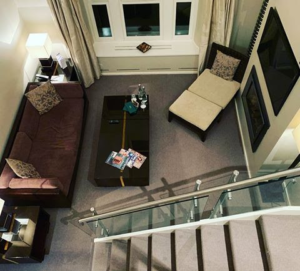 Upon settling into our multi-story suite we took off to explore our luxurious surroundings. With only 86 rooms, the Brook Lodge exudes opulence at the highest levels. The amenities jumped out at us around every corner as we stopped into The La Taverna Armento, their quaint Southern Italian style bistro, Actons Country Pub & The Orchard Café, The Waterside Lounge, Macreddin Organic Bakery, Macreddin Smokehouse and The Wells Spa which is an adult only destination Spa and of course the Macreddin Golf Course. 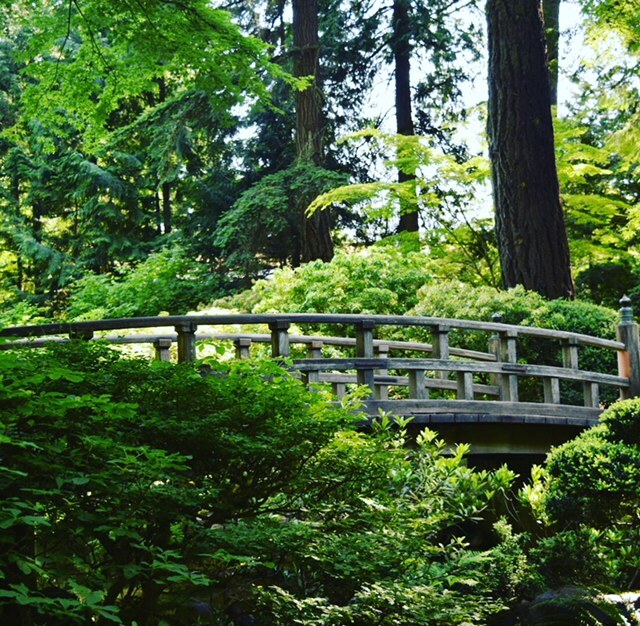 There is plenty to keep one as busy or as relaxed as you choose at this exquisite venue. 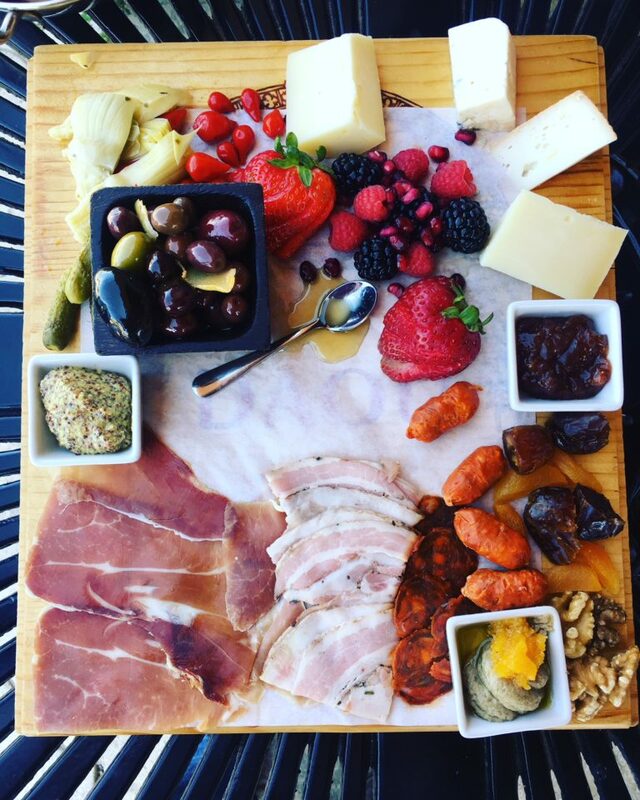 The Strawberry Tree restaurant is known for its true farm to table dining and we experienced it firsthand. 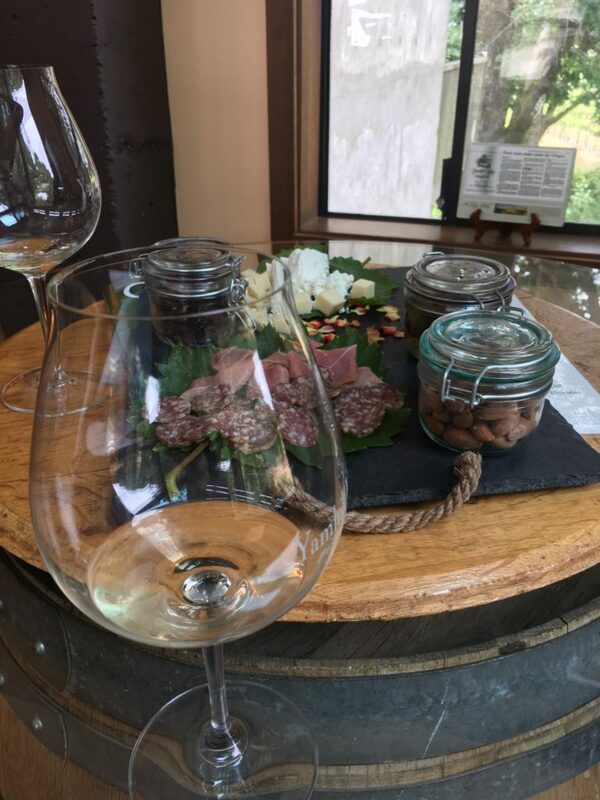 A brilliant dish of beef tartare started off our Michelin experience perfectly and prepared us for what was to come. 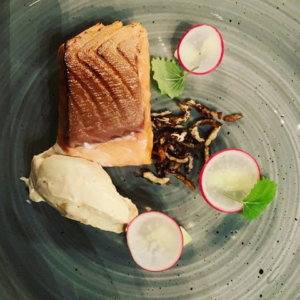 Our next dish, Fresh Atlantic Salmon with creamy potatoes was expertly prepared with unmatched and attention to detail. 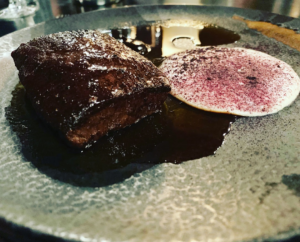 Venison is a staple in this region which made it a must try for us. A medium rare Venison steak arrived at the table a presented by our knowledgeable server with elegance and finesse. The steak glistened in its own juices on a bed of creamy potatoes and jus to our palates delight and will not be forgotten anytime soon. 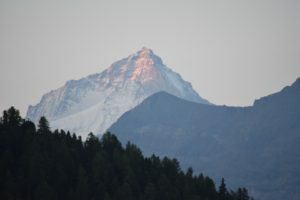 The morning arrived which signaled another day on our expedition and we were in for an education that surprised and pleased us beyond our imagination. 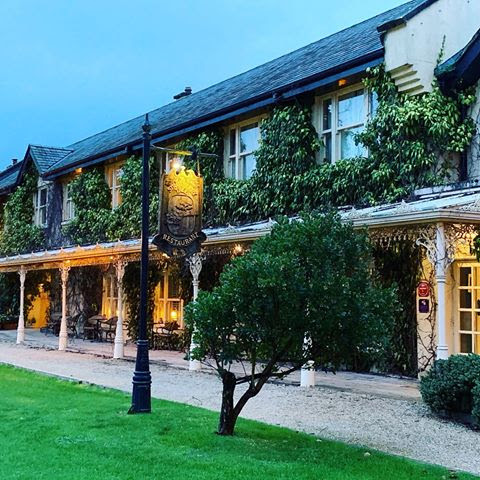 When a spring was discovered in Macreddin Village, it was decided to install Ireland’s largest geo-thermal hotel heat recovery system which heats both swimming pools. Surprisingly All the water used in The Wells Spa is sourced from their own pure water well. After investing more than 2 million euros in a greener future, Macreddin Village has made a successful statement that is years ahead of its time. In addition, BrookLodge & Macreddin Village is the only hotel in Ireland with two, 200 KVA carbon-neutral Wood-Chip Burners providing all the hot water in the guest rooms including the sink, bath and shower. In 2018, Macreddin Village committed to purchasing Biogas. Biogas is not a fossil fuel but is made entirely from organic waste. Biogas combined with woodchip plants means that all the fuel required in Macreddin Village is totally carbon neutral. Macreddin Village has been committed to as the Irish call it “keeping it green” since first opening its doors in 1999. 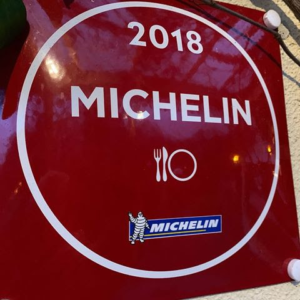 To find this very special village and hotel in the middle of the garden district of Ireland setting the standard for sustainably was a wonderful and welcomed surprise. 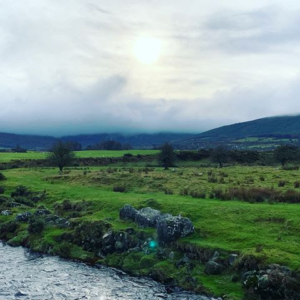 Exploring Ireland is an adventure well worth taking. 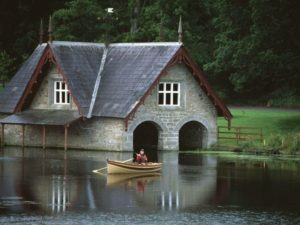 You can explore the emerald island in so many ways but a stay at The Carton House Golf & Spa Resort in Kildare with its rustic charm and fine amenities is must on the itinerary. It’s certainly a true statement as they proudly promote “Ireland’s finest luxury 4 star resort, where historic charm meets contemporary luxury.” The Carton House is located just twenty minutes from Dublin on 1,100 acres of private parkland estate. The Resort is ideal for leisure, business and any special occasion you can imagine. The historic mansion is well worth a stay. 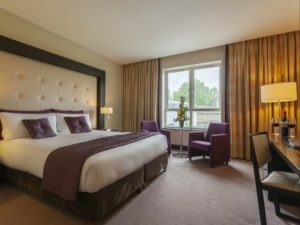 However, the hotel features 2 championship golf courses, 3 fabulous dining venues, an 18 metre swimming pool, Carton Spa, tennis court and state of the art conference facility. Upon entering the resort, we felt the charm and elements of its original character as our thoughts drifted back centuries while incorporating many modern features. We strolled the brightly lit walkways and wandered down corridors admiring the many paintings and sculptures. The staff in the original manor house made us feel very comfortable in what was once the home of the aristocratic Fitzgerald Family, dating back to the 18th century. Carton Spa at Carton House Resort features Pevonia as their product of choice. Made using sustainably sourced, organic ingredients, Pevonia promises a professional result, powered by nature. It is the product range of choice in some of the world’s most prestigious spas and is available to guests and members at Carton Spa. 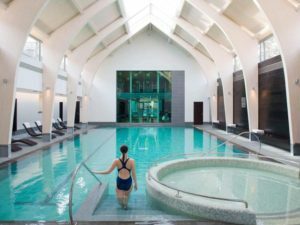 Before a luxurious spa treatment many guests spend the day at the Carton Golf Club located in the middle of 1,100-acres of private parkland in Maynooth County Kildare. 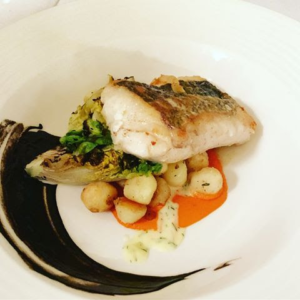 An opportunity to dine the manor house is an experience that will most likely last for a lifetime of memories. Taking our seats in the dining room finished in 1739 surrounded by the original artwork, an elaborate gilded wall sized pipe organ while overhead the awe-inspiring Lafranchini plasterwork made us ponder the lives and stories that once filled these historic rooms causing us to ponder, oh, If these walls could only talk…. 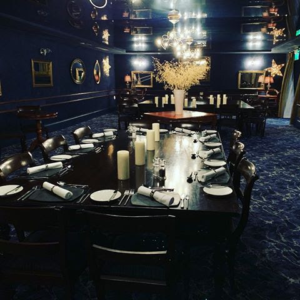 An embossed personalized menu at each seat signaled that this evening would be epic. And it was. 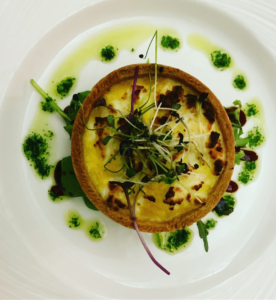 Goats cheese & caramelized onion tartlet with balsamic glaze was certainly a wonderful gastronomic beginning. 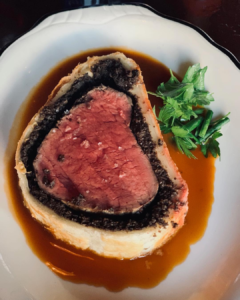 A choice of charred 7oz Tipperary Vale beef tenderloin with Yorkshire pudding or a grilled Hake fillet provided two fabulous entrees to indulge in. We settled on each one and finished this world class historic evening with chocolate chili mousse confit, cherries and pistachio ice-cream. Having dined all over the world, being seated at this table experiencing these dishes was a larger than life experience. Visiting a place where history has given way to a larger narrative that embraces every facet of society, you never know what will be around the next corner, in a small hamlet or a large city. Whatever path you choose on your way along the next fog shrouded Irish hedgerow, you can expect it to be special and create memories that you will never forget.